The Mass Cultural Council is pleased to announce a $10,000 gift from the Gustavo Dudamel Foundation to deepen its support of creative youth development and music education. Elected officials and cultural leaders from the Springfield region joined Mass Cultural Council and Springfield Public Schools students, teachers, and administrators at the Community Music School of Springfield today to announce the grant. 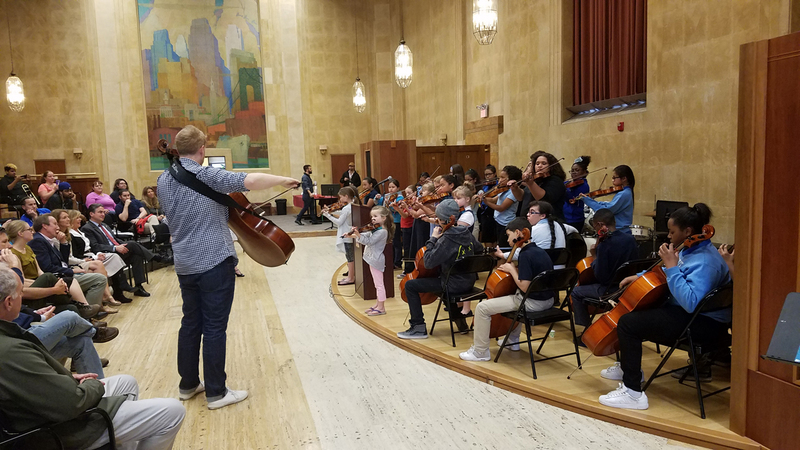 The Schools’ partnership program, Sonido Música uses intensive, ensemble music to strengthen academic and social-emotional learning, and empowers a new generation of young people to work for social justice. Inspired by the Venezuelan El Sistema model, the program is funded through Mass Cultural Council’s SerHacer Program. The Foundation’s grant to Mass Cultural Council will supplement the state agency’s support of 18 El Sistema-inspired youth music ensembles across Massachusetts, and helped to underwrite a student performance supported by the Boston Philharmonic Orchestra and Conservatory Lab Charter School in Boston this past Saturday. SerHacer provides three-year, $15,000 annual grants to each of these programs, provides an instrument library through the Johnson String Project so all youth have quality instruments, and funds a three-year research study that seeks to document the impact of the El Sistema model on the lives of young people. Mass Cultural Council Program Manager Rodrigo Guerrero said the Dudamel grant is another sign that Massachusetts is leading the way in creative youth development, an intentional practice that fosters active creative expression through the arts, humanities, and sciences, while developing core social, emotional, and life skills, for youth of all ages. Creative youth development approaches young people as active agents in their own growth, with inherent strengths and skills to be developed and nurtured. The overall goal is for culture to play a major role in supporting the growth of creative, productive, and independent citizens and thriving communities.